I don't usually review older films, like I do with books, but this merited a mention. 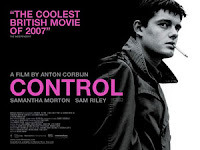 Released in 2007 Control tells the story of Ian Curtis of the post punk band Joy Division. Shot in black and white, it's filled with dark humour and a bleakness that I haven't seen in a film for a while. At one point his mistress says, 'Ian, you're so depressing,' as she cuddles up to him on a sofa, and that sums it up. The acting is of the highest quality and Sam Riley and Samantha Morton bring Ian and Deborah Curtis to life brilliantly. No one had made music like Joy Division and you can kind of see why. Curtis was an epileptic, but also an incredibly complex and selfish character. Their sound is still a wonder, but seeing this film makes you question it. Makes you wonder whether it was born from a genuine soulfulness or was just made by someone with a huge intellect and not much sense of self. At the end of the film, after his suicide (not a spoiler, it's a bio) you just feel incredibly sorry for his wife. The rest of the band became New Order with the addition of Stephen Morris' wife Gillian Gilbert and the rest is history. Control then. Hard to watch at times. Difficult to sympathise with the lead character. Brilliant, brilliant soundtrack.